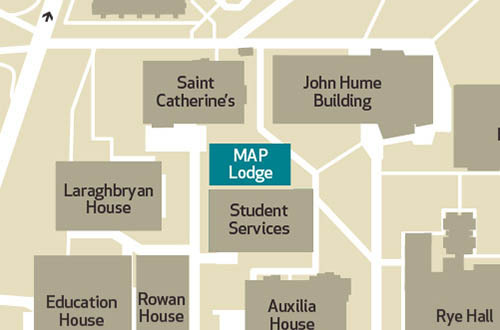 The Maynooth University Access Programme (MAP) encourages under-represented groups to enter third level and provides these groups with support through their time at Maynooth. These groups include under-represented school leavers, mature students, students with disabilities and members of the Irish Traveller community. MAP is founded on 4 pillars; outreach into the community, promoting pathways into University, easing the transition for incoming students to Maynooth and supporting our current students. MAP's supports are personal, academic and financial in nature and are designed to promote confidence and independence. Maynooth University is a national leader in both attracting and retaining school leavers from socio-economic disadvantaged backgrounds, mature students and students with disabilities. From a national perspective, MAP has taken a leadership role in developing national policy in the area of widening participation. From an institutional perspective, MAP has developed a number of models of academic support that support transition to higher education of under-represented groups and are acknowledged as innovative models of outstanding good practice. 28% of the full-time undergraduate student population are mature students, students with disabilities and school leavers from socio-economic disadvantaged backgrounds. Maynooth University has the highest rate of mature student entrants in the university sector. Over 14% of entrants to Maynooth University are mature students compared to a national average of 10%. Maynooth University has one of the highest participation rates of students with disabilities in the university sector. The rate has increased from 3.7% in 2008/09 to over 6% in the current academic year. The number of students entering Maynooth University through the HEAR programme has increased by 250% in the last 5 years. Tugann Clár Rochtana Ollscoil Mhá Nuad spreagadh do ghrúpaí atá faoi ghannionadaíocht ag an tríú leibhéal a bheith rannpháirteach san ardoideachas. Cuireann an clár tacaíocht ar fáil do na grúpaí seo agus iad ag freastal ar Ollscoil Mhá Nuad; lucht fágála scoile atá faoi ghannionadaíocht, mic léinn aibí, mic léinn atá faoi mhíchumas, baill den lucht siúil agus dídeanaithe san áireamh. Cuirtear tacaíocht phearsanta, acadúil agus airgeadais ar fáil chun muinín agus neamhspleáchas a chur chun cinn. Tá Ollscoil Mhá Nuad ar thús cadhnaíochta in Éirinn i dtaca leis na grúpaí seo a leanas a mhealladh agus a choinneáil: lucht fágála scoile atá faoi mhíbhuntáiste socheacnamaíoch, mic léinn aibí agus mic léinn atá faoi mhíchumas. Ó thaobh dearcadh náisiúnta de, tá ról ceannaireachta glactha ag Clár Rochtana Ollscoil Mhá Nuad i dtaca le beartas náisiúnta a fhorbairt i réimse na rannpháirtíochta leithne. Ó thaobh dearcadh institiúideach de, tá roinnt múnlaí tacaíochta acadúla forbartha ag Clár Rochtana Ollscoil Mhá Nuad a chuireann tacaíocht ar fáil do ghrúpaí faoi ghannionadaíocht agus iad ag dul i dtaithí ar an ardoideachas, agus aithnítear gur múnlaí nuálacha iad sin ina gcuirtear an dea-chleachtas is fearr i bhfeidhm. Is mic léinn aibí, mic léinn faoi mhíchumas agus lucht fágála scoile atá faoi mhíbhuntáiste socheacnamaíoch iad 28% de phobal lánaimseartha fochéime na hollscoile. Tá an ráta is airde ag Ollscoil de Mhá Nuad de mhic léinn aibí san earnáil ollscoile. Is mic léinn aibí iad 14% d’iontrálaithe chuig Ollscoil Mhá Nuad, agus is é 10% an meán náisiúnta. Tá ceann de na rátaí rannpháirtíochta is airde san earnáil ollscoile ag Ollscoil Mhá Nuad i dtaca le mic léinn faoi mhíchumas. Tháinig ardú ar an ráta sin ó 3.7% in 2008/09 go breis is 6% sa bhliain acadúil reatha. Le cúig bliana anuas, tá méadú 250% tagtha ar líon na mac léinn atá ag teacht go hOllscoil Mhá Nuad tríd an gclár HEAR. The Disability Office works to remove barriers to learning so students with a disability can participate fully in all aspects of university life. We offer a wide range of supports to school leavers from socio-economically disadvantaged backgrounds who enter the University through the Higher Education Access Route (HEAR).